We’re excited to announce the beta launch of Pixura Platform, a non-technical toolkit for anyone interested in launching any type of business idea based around digital items. 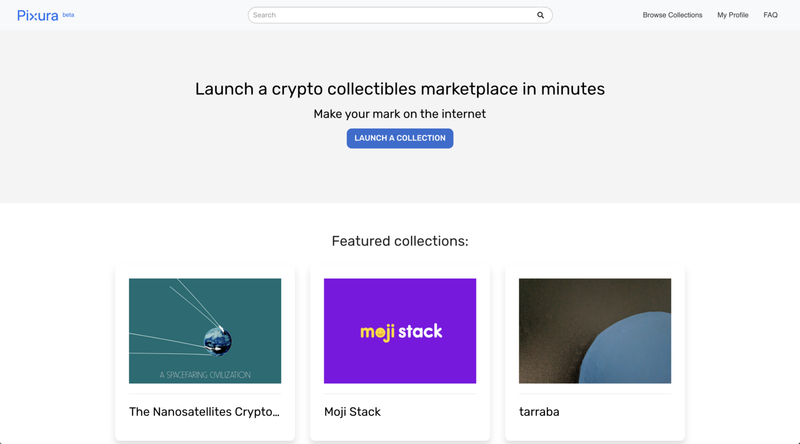 Known as crypto-collectibles, non-fungible tokens (NFTs) or crypto-goods, this emerging blockchain phenomenon has a lot of different names and use cases, but the concept is simple: For the first time, we have the ability to issue own-able digital items that can be globally traded and integrated with a multitude of apps. This means that a secure, trackable digital identity can be assigned to any unique item, whether the item is a tangible pair of sneakers, or an intangible video game asset. This is a really flexible idea, so what can you actually build? Non-fungible tokens are important because they give objects a unique, tradable digital identity, a fundamental starting place for creative and commercial enterprises of all kinds. Our mission is to lower the barrier to entry to building with this technology. Similar to how Shopify and Etsy made it easy for anyone to spin up a global e-commerce website without writing any code, Pixura will empower an army of creators and entrepreneurs to deploy smart contracts and token-based marketplaces using our NFT platform. At launch, anyone can create a digital collectible smart contract, deploy it to the Ethereum mainnet, and start issuing unique ERC-721 tokens with just a few clicks of the mouse. A basic public-facing marketplace is automatically generated and can be customized and shared, enabling you to immediately sell or distribute your tokens. Additionally, Pixura’s easy to use GraphQL API lets developers leverage our token issuance and marketplace functionality and connect to any custom front-end or mobile application. Pixura is leveraging the emerging decentralized web ecosystem. Each collectible contract is ERC-721 compliant, making the assets interoperable across decentralized exchanges (DEXes), cryptocurrency wallets, such as MetaMask, and other dApps. In our upcoming release, marketplace transactions will be signed 0x orders, enabling us to pool and share liquidity with any other marketplace or DEX. By taking advantage of the flexible 0x architecture, we can enable royalties, customer affiliate fees, and other innovative marketplace mechanics. SuperRare.co, our own Ethereum-based digital art platform, is powered entirely by the Pixura tech stack. We are proud to have built a thriving, global community in less than a year; SuperRare is one of the most active dApps, with almost $100,000 earned to date by creators around the world. We’re just scratching the surface of what can built on top of non-fungible token standards and are excited to see all the creative ways that the community uses Pixura. This is the mainnet beta release of the platform. You can try it out here– we’d love to get your feedback on the features we’ve built so far, what else you’d like to see, and what you find most valuable. We can’t wait to see what you build! Thanks to James Ryan Moreau. Cofounder @pixura_io & @SuperRare_co. Passionate about UX for crypto applications.